Ghana need former captain John Mensah back in the side to provide leadership in defence, says former Black Star Samuel Osei Kuffour. Centre-back Mensah, 31, recently returned to club football in Slovakia with FC Nitra after a year out but a recurrence of a back injury has left him sidelined since March. However, Kuffour believes Mensah should still go to this summer's World Cup. "Every team needs a leader, especially from the back. 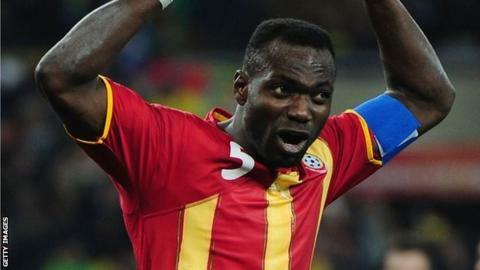 When you have John Mensah there is security," Kuffour told BBC Sport. On Monday Ghana coach Kwesi Appiah will name his provisional 30-man squad for the tournament in Brazil, which takes place between 12 June and 13 July. Ghana have been drawn in a tough Group G alongside Germany, Portugal and United States and the chief concern among Black Stars fans is the team's defence. Appiah has alternated the right back and left back slots between different players and tried at least three different pairings at centre-back through the 2013 Africa Cup of Nations and the World Cup qualifiers. Ghana were beaten in a penalty shootout by Uruguay in the 2010 World Cup quarter-finals after Asamoah Gyan had struck the bar with a spot-kick in extra-time. Kuffour has called for a return to the experienced centre-back pairing of Mensah and Isaac Vorsah, who played together at the 2010 World Cup in South Africa where Ghana reached the quarter-finals. "There are good players at the back but you need someone who has personality, who can drive the team along," he said. "Recently I have not seen anyone doing that even though there are good defenders. That is why you need Mensah and Vorsah." The question is whether the pair can be fit. While Mensah has his back problems, Vorsah has been out for a year with a knee injury - although his Austrian club, Red Bull Salzburg, have predicted the 25-year-old will recover in time for the tournament. "Ask yourself how many of our players play in the top leagues in Europe," said Kuffour. "It's not easy for Kwesi Appiah to make the decision to bring any of them back. It takes courage to do that. Kwesi Appiah knows what they mean to him. "If he takes both players I won't be surprised, if he he takes only one I will be very happy." Despite the defensive permutations and expectations on the team to do well in Brazil, former Bayern Munich Kuffour believes the Black Stars will deliver. "We are under pressure because of our previous performances in 2006 when we reached the second round and in 2010 we were quarter-finalists and were unlucky not to set the record as the first African team to reach the semi-finals," he said. "What pleases me is that Ghana know how to play in tournaments. We will do well. My calculation is we need to beat the USA, draw with Germany and draw with Portugal and then we will be through the group."